A search for “Obama congratulates Israel on 62nd anniversary” pops up numerous results, but for 2009, not 2010…you remember, back when Obama was stilll carrying on the presidential charade. Reader “Gee” has just sent a link to a Jerusalem Post announce that Obama has, indeed, congratulated Israel on their 62nd anniversary. Thank you, Gee! Excuse Me. 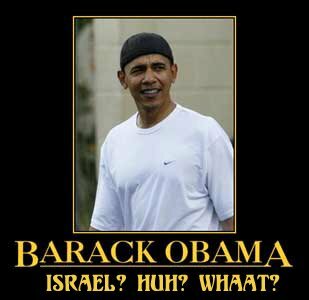 Where is Obama’s Congratulations Message to Israel on its 62nd Anniversary of Independence? extended a message to Israel but nothing from Obama. NOTHING from Obama. helping shoulder your burdens, as we face the future together,” the U.S.
she and her muslim appeasing President approve of. Disgusting.